Just 41 km (26 miles) south of Geneva, the lakeside town of Annecy makes a terrific day trip. Here’s how to (or how not to) spend one day in Annecy, France. “Are we lost?” I stopped my bike and glanced back at my husband, Mark. He gave me a look. That look. Of course we were lost. We’re always lost in France. Usually it’s the fault of our wretched GPS, but as our rental car was back in a parking lot in Annecy, I couldn’t blame it. I couldn’t even blame my husband (though I tried to think of a way.) No. We were lost because I’d convinced Mark that the bike trail goes all the way around Lake Annecy. I’m sure I’d read that somewhere. 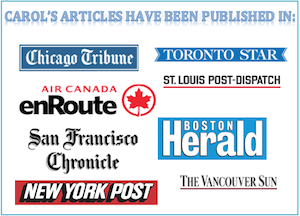 Note to readers: Don’t believe everything you read. Or at least don’t believe it will be easy. Get a map. Renting a bicycle is one of the best things to do in Annecy, a sun-laden (unless, of course, it rains) lakeside town near the Swiss border in southeastern France. But, the trail runs for some 40 km so if you keep cycling farther away from the town when you’re convinced you’re circling back, your legs will get tired, the sun will relentlessly slam down on your head and you’ll become grumpy. Why me, asks my husband? Thirty minutes later my thigh muscles were twitching and we’d lost sight of the 14 km long lake altogether. (Lake Annecy, or Lac d’Annecy, is the third largest lake in France.) If we wanted to get back in time to explore the town, it was time to admit defeat and turn around. This made me even grumpier. In my defence, we wouldn’t even be spending one day in Annecy if it weren’t for me. I’m the trip organizer in this duo. 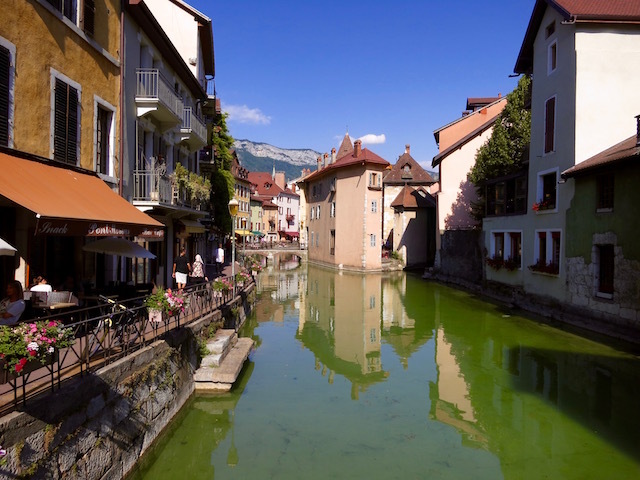 And Annecy, an alpine town in the Haute Savoie region of France, is an ideal destination for a day trip, especially on a sunny breezy day when the lake is blue, the hills of the surrounding Rhône-Alpes are blue, the sky is …. well, you get the idea. Also, the buildings are historical and the deserts excellent (when you ride too far on your rented bicycle sugar takes on a grave importance.) And while Mark and I were cycling (slowly) back to Annecy (because someone’s legs were tired) I had a revelation about Annecy, which I’d now like to share. Annecy has a split personality. There’s the historical town of Annecy, with its canals and little shops and sidewalk cafes and which, if it weren’t for all the French being spoken and the lack of spaghetti you might believe you’re in Venice. Then there is Lake Annecy. 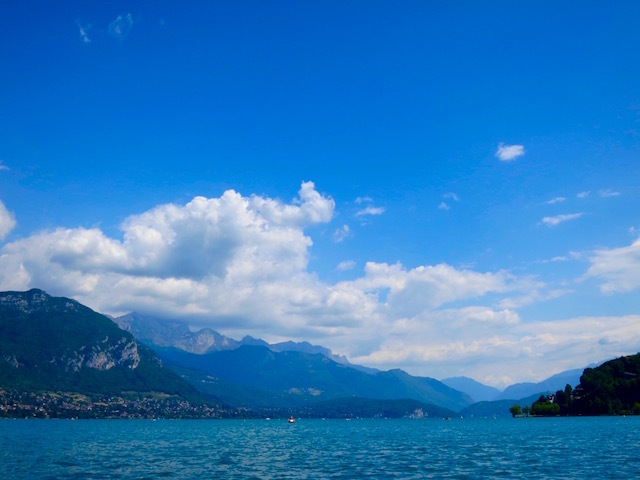 Lake Annecy is right at the foot of the town, but it might as well be a world away because it’s more like an outdoorsy beach resort complete with a grand old hotel, the Hotel Imperial; bike trails (that don’t go all the way around the lake) and endless boating activities. 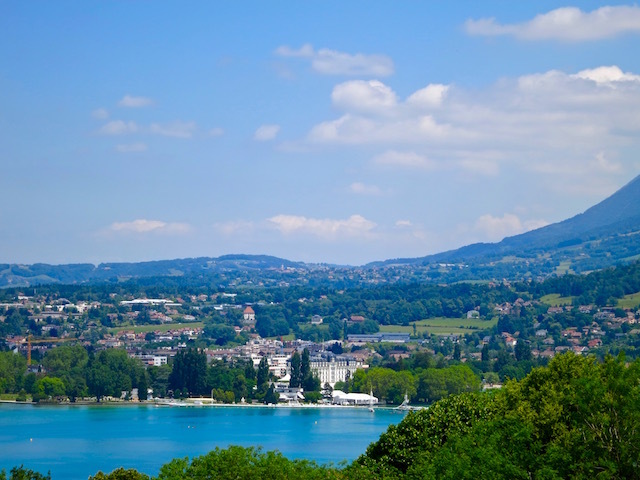 When it comes to fun things to do in Annecy, if you’re any type of sporty traveller at all, you’ll want to spend time at the lake. 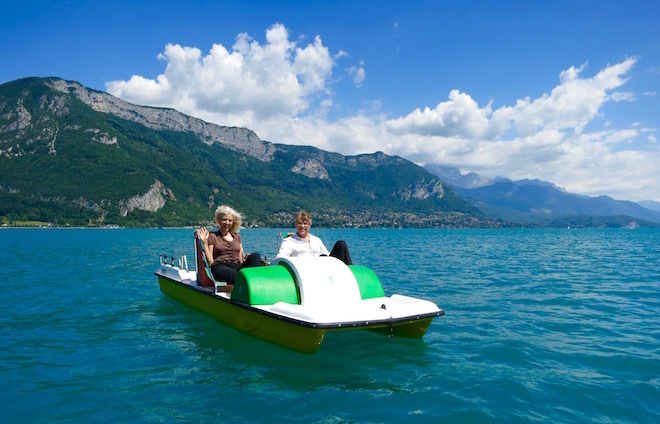 When we (finally) arrived back at Lake Annecy and returned the bikes, I had another revelation: I have a split personality, too, because as soon as I saw pedal boats for rent, I turned into Super Sporty Woman. “Let’s rent pedal boats!” I said to my husband, even though two seconds earlier I’d been staggering around moaning about my sore muscles and swooning from heat fatigue. We rented a pedal boat. 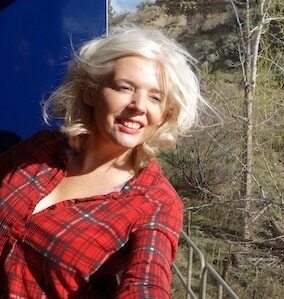 And if you’re someone other than my husband, who hates them, and especially hates that I wave at absolutely everyone when I’m on one, it’s one of the most fun things in Annecy to do. If you’re planning to follow the same ‘one day in Annecy itinerary’ that we did, I recommend you have lunch before you rent a pedal boat and get lost on a bicycle – unless of course you’re one of those mythical early birds I’ve heard so much about, then you can have lunch after. 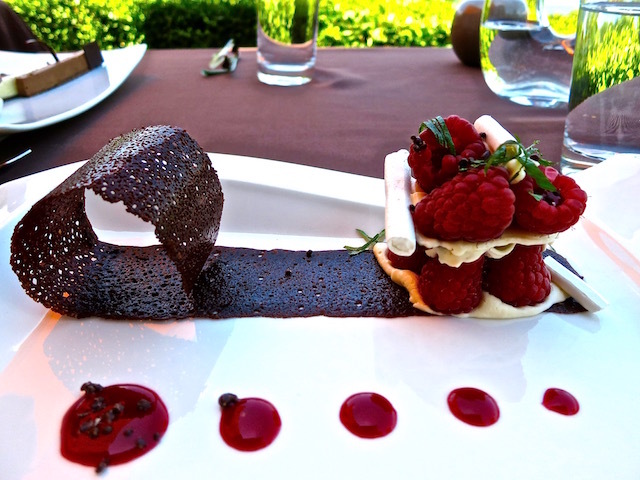 Whenever you eat, you should have lunch at Le Belvedere. If anything can make a husband who hates pedal boating love his wife again, it’s the food at Le Belvedere, a one Michelin star restaurant above town at the foot of the Semnoz Mountain. It has gorgeous views of the lake that you can drink in along with your wine. If you don’t have a car, you’d have to be sporty to pedal a bicycle up to Le Belvedere. You’d have to be even more sporty (not to mention stupid) to try with a pedal boat. I recommend a taxi. 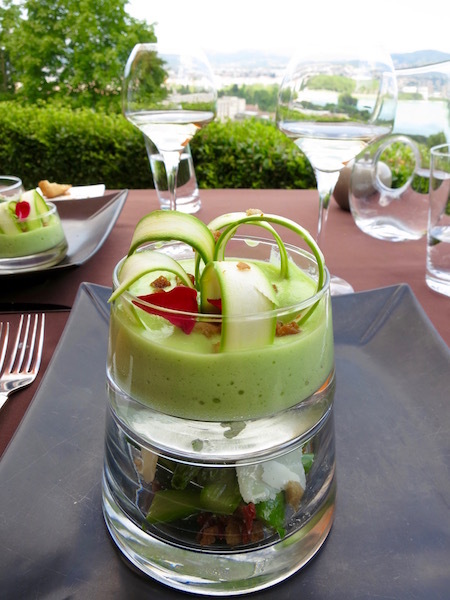 If the weather is cooperative sit on the terrace and splurge with their set lunch menu at 37 Euros. In our case it was worth it to save our marriage. Mark is still raving over their cheese platter, while I can’t forget the chocolate dessert. 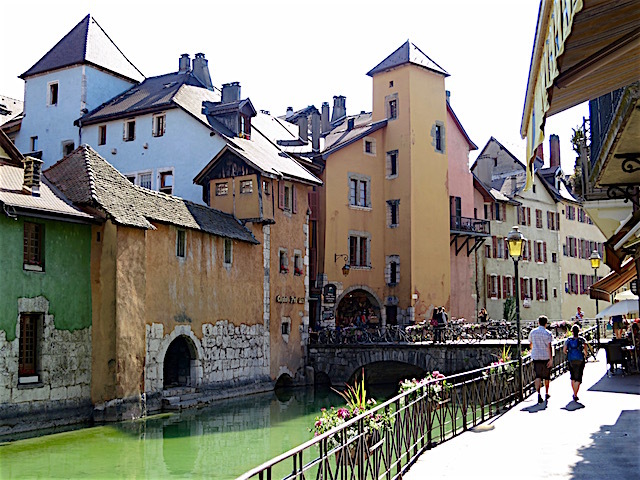 Once your husband loves you again, and you love the world because of the glass of Roussette de Savoie Marestel you drank at lunch, it’s time to explore historic Annecy. The Old Town is a watery place, sliced through with canals from the River Thiou. The thing to do is wander around, take photos and enthuse about the cute canals and historic buildings. One of the buildings everyone enthuses over is the Palais de l’Ile. It’s exactly the size of the rock island it sits on (so you have to look very carefully to see that it is, indeed, on an island). Built in the 12th century, the Palais de l’Ile was once a prison, and possibly, if I make my husband go pedal boating again, he’ll try to lock me up in there. If you’re seeking sanctuary from a husband who would like to lock you up, consider visiting one of Annecy’s churches. 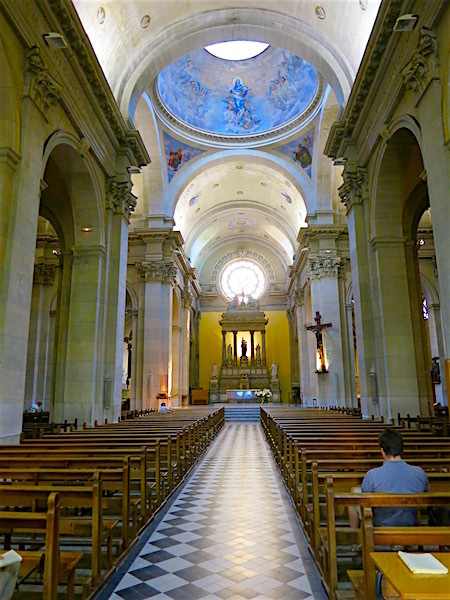 I’m partial to the neo-classical Notre Dame de Liesse Church, Built in the mid 1800s, it’s constructed on the site of a 13th-century sanctuary. The clock tower is from the 1500s and there’s an even older Gothic stained glass window. There is so much else to see but if you have only one day in Annecy, you’ll be hard pressed to fit it all in. You can walk up to a museum in a castle built by the Counts of Geneva, the Musee Chateau d’Annecy. Mark and I were too lazy to go in. We were also too lazy to go hiking up in Le Semnoz. I blame the wine at lunch. I blame the chocolate dessert, the pedal-boating and, just out of habit, our wretched GPS. But most of all, I blame a scenic cycling trail that doesn’t go all the way around the lake. But if it did (and I could find the path), I’d cycle back to Annecy every chance I got. 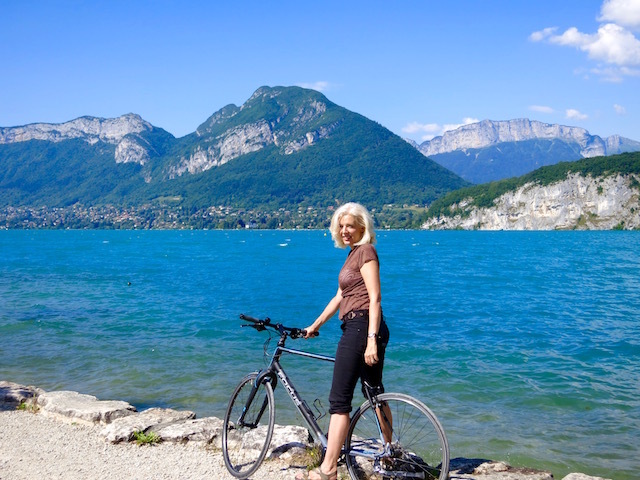 Cycling: It may not sound like it from this Annecy travel blog post, but cycling along the lake (and beyond) is one of my favourite memories of visiting Annecy. Roul’ ma poule has bike rentals in two locations, one one on 4 Rue des Marquisats and 47 Avenue du Petit Port. If you go to their website you can see that it IS possible to cycle around Lake Annecy. Obviously, this was beyond our navigation skills. If you manage it, let me know. If you prefer to eat in town the elegant one Michelin star La Ciboulette is highly rated. 10 rue Vaugelas. Boat Cruises on Lake Annecy are popular. If we’d had more time it would have been fun to do a dinner cruise with Compagnie des Bateaux du lac d’Annecy. 2 place aux Bois, Annecy. Extreme Adventure: You won’t catch me doing this but Annecy is a centre for paragliding. One company to offer this is Annecy Adventure. 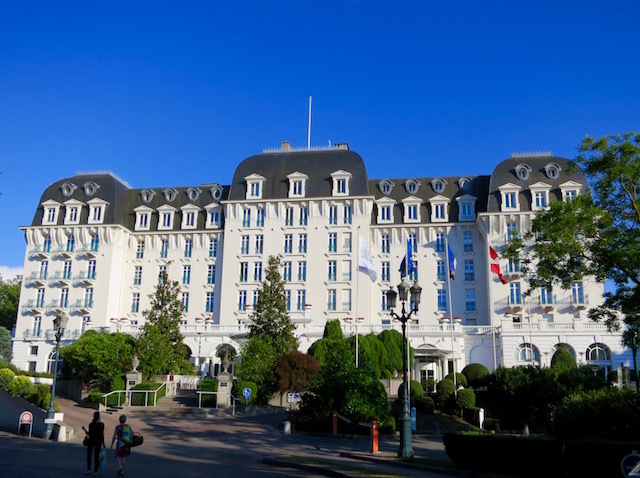 If we’d stayed overnight hands down I’d pick the Imperial Palace, a large Belle Epoque hotel right on Annecy Lake at Allée de l’Impérial. 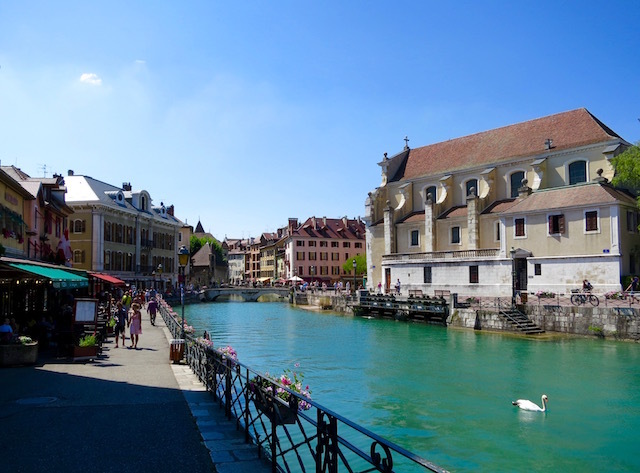 A day trip to Annecy from Lyon is possible, though you’d probably want to stay the night. Annecy is a 2-hour train ride from Lyon and roughly 1 hour 40 minutes by car. 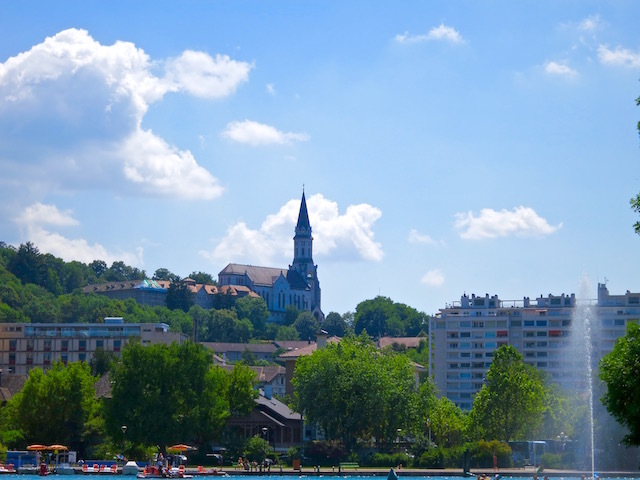 A day trip to Annecy from Geneva is easy if you’re driving as it’s only 41 km away. You can take a bus from the Gare Routiere, the Geneva Coach Station, but with several stops it will take about 1 hour 40 minutes. Train is even slower and not direct. 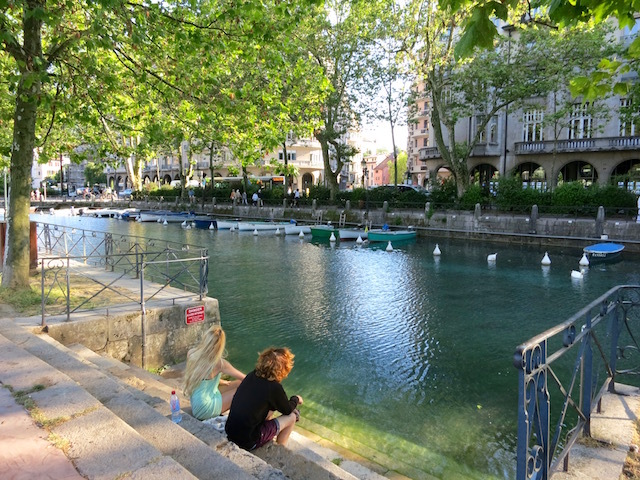 Spending one day in Annecy from Aix-Les–Bains is what we did. It’s only 35 km away. We drove but there is a direct train from Aix-les-Bains-le-Revard Station that takes half an hour. The Annecy Tourism Board has a great travel info. Read more about traveling to Europe or about French destinations to visit. Love this! Thanks for info. I’m glad you enjoyed your trip to Annecy Shreenarayan – it sounds like you loved it. Ah, well, Aline. I was the same when I was a teenager. The good thing is that is all sinks in at some level. Hey carol what a great time you both had.We are going to europe in October so we will put this on our bucket list. Possible to take this in your article ? What a lovely little town Annecy is! We’d not heard of it before, so it was fun to be introduced to it. And bicycling does sound like a great way to explore it (but we’d probably get lost too – when I think we should go right, George thinks we should go left – that’s how good our sense of direction is!). Good the chocolate and cheese made the world right and bright again for you two :-). I’m sold, sign me up. The town looks fabulous and reminds me a lot of Lake Como with a twist of Venice. I can see myself spending a few days here. You have to let me know how you like it, Miriam. Have a great trip. What a great way to describe Annecy, Como with a twist of Venice. Nice to hear from you, Carmen. A vacation house in Denmark sounds hard to beat, Mikkel. Someday soon! What a fantastic post and the timing couldn’t have been better! I’m heading to Annecy in May and will be visiting on a day trip from Geneva. I’d love to visit Colmar and Riquewihr, too. I just love those fairytale places. Your photos are absolutely stunning – this looks a lot different than the France I’m used to (Paris). Carol. I know near nothing about Tour de France and even worse don’t eat meat or drink wine. Your husband may choose another travel or dining partner…. That said I would dearly like to invite you to Denmark (standing offer). We have a vacation house there (hope up to your standards) that we don’t use and that you can have for free any time. Only condition is that you say something nice about my home (called bribery…). Please do come and I will ensure you and your husband have a great time! Thanks so much, Trisha – Annecy really is a multi-purpose destination. I heard about Annecy while doing research about paragliding and I didn’t know it’s a cycling-friendly city! I always look forward to cities with a thriving cycling culture. It’s a healthier and more convenient alternative way of seeing a city. I love how the place has it’s old town feel intact! Glad to hear about both your adventures and misadventures, Carol! Thanks, Antonette – We should start a pedal boating support group. Looks like such a beautiful place to get lost. The views are amazing. I will take note to not believe everything I read or think I remember since that happened to you haha. Mikkel, you crack me up. You and my husband would get along famously, you could both talk about the Tour de France while I complained about my tired legs. He will greatly appreciate your sympathy, I’m sure. Carol…. Another fantastic blog. Surely makes you want to come to Annecy… Now I have virtually zero interest in sports except what that which I do myself. However, I am From Denmark – the one of the bicycle by right (not in actuality) of so seem to recall Annecy was the seen of Tour de France one year. If I am right then I am somewhat disappointed that a sporty lady like you do not rise that same section of the Tour. Choosing instead leisure from pedal boats and cocktails (and shoeshopping?) seems like what Kierkegaard what have referred to as the Astestic. If one day you would allow your dear husband a chance I am sure there are many of us who would love to meet or hear from him. His patience and ability to accommodate a stubborn lady like you is admirable… He has my entire sympathy…. Sorry … Could not help it. Keep the wonderful blogs coming. Hey Aussie, Hiking and biking directions always confuse me … and I always blame the directions, not myself. Hi Agnes, I’m surprised how many people have visited Annecy. Glad you enjoyed it. I think we could all understand you licking the screen for that dessert, I definitely went in for a close up on all the components! The lake looks beautiful to ride around, we’ve certainly followed some directions like that at times wondering what were they thinking when they wrote it, it sounded so simple but I did twice the distance and still think I missed something.